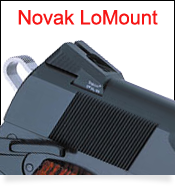 The Novak® LoMount™ dovetail is a somewhat standard dovetail sight cut found on many popular factory-fitted (OEM) and custom platforms. The Kensight® DAS™ (Defensive Adjustable Sights) and DFS™ (Defensive Fixed Sights) are the perfect low profile upgrade for your concealed carry, or combat carry pistols, due to a smooth, thoroughly "dehorned", low-profile exterior. The benefit of this feature is there are no sharp edges to cut hands or catch on clothing during the draw stroke which compliments your concealed carry or defensive style 1911. This particular sight will only fit an existing Novak® LoMount™ 1911 dovetail. If you unsure of your current dovetail configuration and would like to know more about dovetail styles, click the button below. A front sight with dovetail dimensions of 0.330" (Width) x 65° (Angle) x 0.075" (Depth) has become known as a “standard” front sight in the industry. While these were first seen on 1911 slides with the Novak LoMount rear sight, other OEM manufactures have adopted this same size for their 1911 platform. There are two basic configurations of the “standard” front sight base. One is the “Flat Base” style and the other is the “Contoured Base”. The dovetail dimensions are both the same, so the base selection is a personal preference depending on the profile on the top of your 1911 slide. 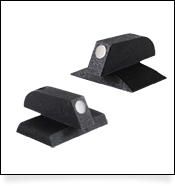 We recommend that you check your existing front sight dovetail dimensions, before purchasing the standard front sight. The front sight height will greatly vary depending on your rear sight selection. Most of the Kensight DAS˜ (Defensive Adjustable Sights) will require a front sight height of 0.190” - 0.200” tall. We ship most of our DAS sight sets with the recommended 0.200” tall front sight. In some cases your existing front sight may work, but this could limit the amount of elevation adjust-ability in the rear sight. If you would like to learn more about front sight heights, visit our Front Sight Height Guide. Our sights are compatible with many factory-produced and custom 1911 pistols. The Kensight DAS and DFS line of sights will fit certain models of Springfield Armory, Colt, Wilson Combat, STI International, Les Baer Custom, Rock River Arms, Dan Wesson 1911s and many others which include the Novak LoMount Dovetail sight cut. For a complete list, See our manufactures page. Most of these manufactures offer both a target style 1911, and a carry style, which include the Novak LoMount Dovetail cut. Click on the manufacture’s Logo below to see all styles of Kensight Sights available for your particular 1911 platform. 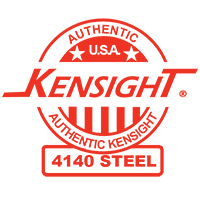 This is an authentic Kensight ® sight, and not to be confused with other brands. When it comes to durability, and features the Kensight® sights far exceed our competitors. Our sights are Wire-EDM machined from a single billet of 4140 chrome-moly steel. The result is a precision sight built with better materials and the Wire-EDM construction ensures the tightest tolerances possible. This translates to ultra-smooth adjustments, audible clicks for both windage and elevation, and consistent dovetail dimensions in which the "industry standard" CNC construction cannot compete. Backed by our Limited Lifetime Warranty, Kensight 1911 sights are premium quality and the first choice for factory-fit OEM manufactures, competition shooters and professional's worldwide. Quality, well made. Oversized for a perfect fit with slight filing. Takes 10mm like a boss. Been running these sights on a Fusion 10mm 1911A1 that I built. Several hundred rounds later, including a lot of Underwood and some seriously mean hand loads; this read sight is still going strong. In fact, my newest 10m creation will be running the same Kensight front and rear sight combo. Works great! This is the only one I found that will work on a Ruger. Put it on a Sig 1911 ultra compact, minor fitting with a stone. Once started slid right in (using sight tool) . Next will be my Ruger 1911.